Definitive cinema attendance figures for Europe in 2014 have been published by cinema trade body UNIC, as part of its 2014-2015 General Report. Preliminary figures were released by UNIC back in February and are largely the same, so the report is more interesting for its analysis of market trends, advocacy work other aspects of UNIC’s role. The report arrives two weeks before the CineEurope conference that UNIC arranges in Barcelona together with Prometheus Media Group (PMP), having just singed a long term agreement to continue working together. It is worth recapping that there was slight growth in the market overall (box office up 0.6% and attendance up 1.7%), despite weak performance by ‘international titles’ (read: Hollywood studio films). This mean that markets such as UK, Germany, Denmark and Italy amongst others saw a fall, while France was up on the strength of several local titles, as was Spain. There was also growth in Central & Eastern Europe, Russia and Turkey. Average attendance was 1.5 visits per capita across the UNIC territories. France and Ireland were out ahead with 3.1 while low (0.8) but growing in Turkey. Lots of local success stories in Holland, Poland and Scandinavia. The number of screen per inhabitants was steady in 2014, averaging 54 screens per million inhabitants across the UNIC territories. Ireland, France, Norway and Sweden had the highest penetration, though the last of these two saw a slight fall in 2014. Growth many took place in Central Europe and Russia. Spain fared poorly, with plenty of screen closures, which UNIC attributes to an “ill-advised VAT increase on cinema tickets” [something now proposed for Sweden as well! ], high levels of film piracy and an economy in the doldrums. The ‘Taking Stock and Looking Forward’ section is in many ways the most interesting, because it shows the growing importance of cinema to the audio-visual sector. Using figures from IHS, the chart above illustrates box office versus home entertainment in the EU10, with physical video (i.e. 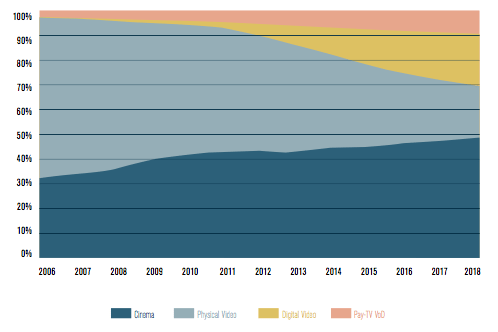 DVD) declining at the expense of not just the Netflix services of this world, but significantly also cinema, predicted to come close to 50% of overall contribution by 2018. In 2014, audience initiatives such as the Fiesta del Cine (Spain) and the 14 < € 4 Campaign (France) illustrated the broad appeal of cinema-going and realised the untapped potential of new audiences. Such campaigns – coupled with sophisticated marketing strategies involving social media, the use of ‘big data’ and mobile services – can help the sector grow attendance during periods of otherwise moderate consumer spending, demographic change and increased compe- tition from other leisure sectors. The message is that while Hollywood studios are focused on China and other emerging markets, they should not forget that Europe is as much of a large market as North America and some parts of it are still growing significantly. But there is an equally strong message to European politicians, with the report saying that “Policy-makers in Brussels must recognise this opportunity and put the theatrical success of European films at the centre of their support strategies.” It calls of online platforms to be active participants in the film eco-system of Europe and that players such as Apple’s iTunes, Google, Netflix and Amazon have to recognise the importance played by cinemas in Europe. The report then details UNIC growing role as an advocacy group for the cinema community. Recognising that there are “critical and at times ill- informed statements by Commission decision- makers regarding film industry distribution practices in Europe,” there is clearly a major role for UNIC to play here in giving the primary film distribution outlet a strong and common voice. There is too much Euro politics (European Film Forum, Transatlantic Trade and Investment Partnership, Pirate Parties and more) to cover in detail, but the report does a good job of pulling together all the different strands and makes a strong case for its vision and role. The headlines of the ‘Summary of UNIC’s Key Policy Positions’ tell their own story: Digital Opportunities, Rewarding Creativity and Investment Into Cinema, Film Release Practices, Music Rights Payments, Disability and Access and Taxation are all hot-button issues that we will be hearing more about in 2015. UNIC then pulls this all together, arguing that “Cinema is an essential part of European Culture,” “Cinemas has a significant Economic Impact” and Cinemas have a powerful social influence.” It is important in realising this that a document like this is as much for the members as for Brussels bureaucrats and national politicians to help steer them away from policies that harm cinemas (hello Sweden’s Minister of Culture!) and towards one that promote a wide range of films and cinema going. The third section reviews the year at Unic, a snapshot of which you can see to the right. The book ends with the list of members and partners. “Partners in the European Commission and Parliament consistently called for more evidence concerning the many economic, social and cultural benefits that cinemas contribute to society, as well as to the well-being of the entire film eco-system. UNIC has clearly demonstrated not just the importance of the cinema sector, not to mention its resilience in the face of an onslaught from everything ranging from Netflix to the World Cup in 2014, but also the important role that a trade body like it plays in acting as a focal point for the industry and a force for action. No doubt we will be hearing more in two weeks in Barcelona.